The VibMinder handheld data collector instrument stores the vibration values and the exact time (and date) of the measurement. 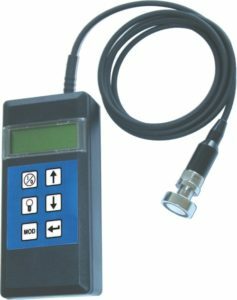 The instrument measures total level vibration (RMS-velocity, characteristic value for machine-condition) and high frequency RMS-acceleration (characteristic value for roller bearing-condition). Data collected with VibMinder can be transfered into the EasyTrendPro or ProfiTrend PC-software via serial interface with automatic dumping into the database. The trends created from this data inform about machine condition, bearing condition and maintenance urgency. The VibMinder is also usable for dynamic balancing. The manual delivered with the instrument helps to interpret the measurements and the trends.